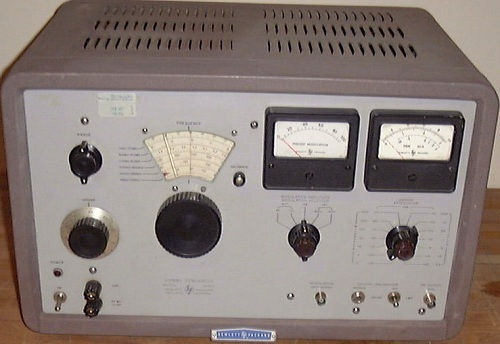 The Hewlett-Packard Model 606A is a general purpose signal generator with a frequency range of 50 kHz to 65 MHz. The instrunient has a direct reading frequency dial calibrated to an accuracy of 1%. Output is held constant within ± 1 dB and is continuously adjustable from. 01 microvolt to 3 volts into a 50 ohm resistive load. An internal crystal calibrator provides check points at 100 kHz and 1 MHz intervals with an error of less than 0.01%. A front-panel meter accurately indicates the percent amplitude modulation for frequencies within the modulation bandwidth of the signal generator. The level of the RF oscillator is stabilized by a feedback circuit from the RF oscillator to the oscillator level control tube. In a similar way the RF output and modulation levels are held constant by a feedback loop from the RF output through the differential amplifier to the modulator. The rest of the block diagram represents standard circuitry for signal generators. Do you have content, to add, about the Hewlett Packard 606A - Signal Generator or associated topics? Please feel free to Share it, here!